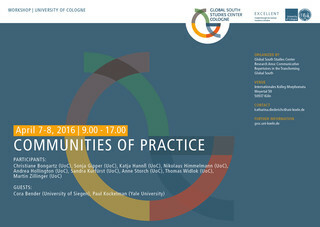 The term ‘Community of Practice’ (CofP) serves as an umbrella notion for various communicative forms of exchange occurring in a multiplicity of contexts. While ‘community’ captures the participatory constellations of such exchanges, ‘practice’ refers to an array of exceedingly diverse undertakings: a CofP can arise rather suddenly around a single enterprise and vanish quickly after it has ended. Other CofPs may result in long-term interaction and involve the development of institutions. Examples range from political demonstrations, to professional apprenticeships or conversion into new religious movements. Dimensions of variability include time and space, communicative intentions, channels, and means, constituency, and other aspects. Historically conceived as and today broadly applied to describe the coming together of individuals around certain enterprise it is the very inclusiveness of this CofP characterization that constitutes its appeal for interdisciplinary work. In our research group, we would like to explore its current ‘usefulness’ and potential modifications. The main purpose of this workshop is to discuss the role of communicative repertoires and practice in a diverse range of CofPs in the Global South. We aim to examine how people in multilingual/multicultural settings succeed in interacting with each other. We are particularly interested in contexts where not all interactants share the same communicative repertoires and meanings in common. The question arises, how the actors involved in the joint enterprise succeed in creating common understandings in the absence of consensus. The workshop’s objective is to discuss the emergence of communities of practice in different settings and to explore how interaction among the members is actually (de)stabilized.